Ahhh, 1 May. So many different things to different people. Here in China it is Labor Day (see last year’s post http://www.bookofdaystales.com/international-workers-day/); in Celtic regions of Europe it is Beltane; and in England and Germanic countries of Europe it is May Day marking the start of summer with Maypoles, fresh flowers, and whatnot. England will be my focus this year. People who know me personally, and some who know me through my posts, will know that I foam at the mouth and seethe when I hear the nonsense spouted about the supposed “pagan” origins of English folk customs. Words such as “ancient” and “traditional” are bandied about with no definition and precious little understanding of the history of customs. How about this from Wikipedia? The earliest May Day celebrations appeared in pre-Christian times, with the Floralia, festival of Flora, the Roman goddess of flowers, held April 27 during the Roman Republic. Unless I’m sadly mistaken, 27 April is not 1 May. In the same vicinity, yes, but hardly the same day. This is just a crude attempt to push the history of the festivities back to “ancient” times. The idea that May Day was originally a pagan (pre-Christian) holiday stems from 19th century mistaken interpretations of Puritan documents of the 16th century by heavy-duty Romantic British and German folklorists and social anthropologists. Prior to the Reformation in England many folk customs were sponsored by the (Catholic) church as money makers selling beer at these events (which they brewed themselves). Puritans railed against these events – mostly because of the beer – labeling them “pagan.” But by “pagan” they did not mean druidical or such, they meant “Roman,” that is, emanating from the center of Catholicism – Rome being at one time the capital of the “pagan” world, and from which Puritans thought all Catholic “superstitions” originated. In this mindset “pagan” equals “Catholic.” But the 19th century Romantics took the “pagan” bit at what they thought of as face value. 19th century social scientists saw the Industrial Revolution as a great curse (so do I). They imagined a pre-Industrial “Merry England” in which rural people frolicked in ways they had done for centuries, if not millennia, keeping alive traditions that were being quickly eroded by the growth of Industrial towns and the concomitant rural depopulation. There is not one shred of historical evidence for this speculation. If you want a definititive analysis of the actual history of an English folk custom read my book (written under my English nom de plume) The History of Morris Dancing. [Author’s Warning: it is long and detailed. It also happens to be correct !!]. One of my great joys is that modern Romantics hate it. Sorry, sometimes the truth hurts. Nonetheless, I am very happy to see people having fun on May Day, as long as they don’t try to regale me with historical nonsense. When I was at Oxford I danced with Oxford University Morris Men every dawn in the streets, following the annual singing by the choristers of Magdalen College at the top of the college tower. The singing is genuinely old (15th or 16th century), but the morris dancing is not. 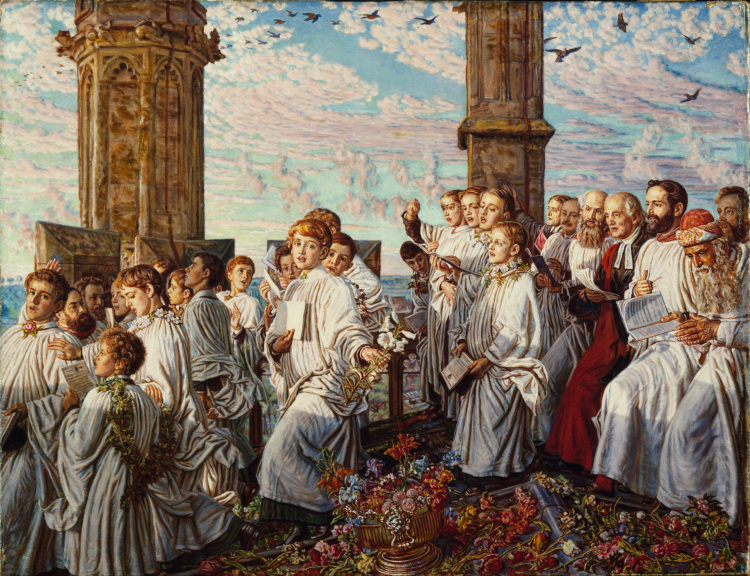 Here’s Holman Hunt’s (http://www.bookofdaystales.com/william-holman-hunt/ ) suitably Romantic image of the choir from 1888. The morris dancing was initiated by OUMM before WW II (taking advantage of a pre-existing celebration), abandoned in the war years, and then taken up again with a bit more fervor in the early 1950s, and continues to this day. Despite its modern origins the dancing is frequently cited as a “traditional” or “ancient” custom by people with no clue. Historically morris dancing has virtually no connexion with May Day. Its prime season was Whitsun (Pentecost), and was primarily associated with this time because the farm laborers who performed the dances had some time off from their work. 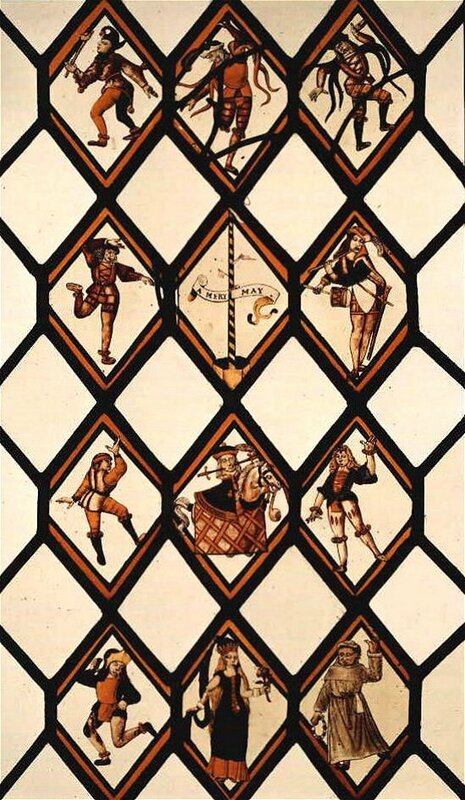 Sometimes the so-called Betley Window (top image), a 16th century painted window of debatable provenance, is cited as evidence that morris dancers were active at that time in May celebrations. Unfortunately this thesis is blown when you learn that the figures in the window are copied from a late 15th century Flemish engraving titled ‘Querfüllung mit dem Tanz der Verliebten’ [‘Panel with the Dance of the Lovers’]. Oh well. Me 1 Romantics 0. Against May, Whitsonday or other time, all the yung men and maides, olde men and wives run gadding over night to the woods, groves, hils & mountains, where they spend all the night in plesant pastimes, & in the morning they return bringing w[ith] them birch & branches of trees, to deck their assemblies withall, and no mervaile, for there is a great Lord present amongst them, as superintendent and Lord over their pastimes and sportes, namely, Sathan prince of hel: But the cheifest jewel they bring from thence is their May-pole, which they bring home with great veneration, as thus. They have twentie or fortie yoke of Oxen, every Oxe having a sweet nose-gay of floures placed on the tip of his hornes, and these Oxen drawe home this May-pole (this stinking idol rather) which is covered all over with floures, and hearbs bound round about with strings from the top to the bottome, and sometime painted with variable colours, with two or three hundred men, women and children following it with great devotion. And thus being reared up, with two handkercheefs and flags hovering on the top, they straw the ground round about, binde green boughes about it, set up sommer haules, bowers and arbors hard by it. And then fall they to daunce about like as the heathen people did at the dedication of the Idols, where of this is a perfect pattern, or rather the thing itself. I have heard it credibly reported (and that, viva voce) by men of great gravitie and reputation, that of fortie, threescore, or a hundred maides going to the wood over night, there have scaresly the third part of them returned home againe undefiled. These be the frutes which these cursed pastimes bring forth. Neither the Jewes, the Turcks, Sarasins, nor pagans, nor any other nations how wicked, or barbarous soever, have ever used such devilish exercises as these, nay they would have been ashamed once to have named them, much lesse, have used them. Yet wee that would be Christians, think them not amisse. The Lord forgive us, and remoove them from us. You have to love it. I suspect that Stubbes had no idea about actual customs of the day, or, at best, presents us with a few glimpses of the truth. You will note, however, that he expressly says that pagans did NOT do this. There are a few early modern images of Maypoles in English towns, some of them permanently erected, and many more written descriptions, largely from the Interregnum and Restoration, respectively condemning them and praising them. 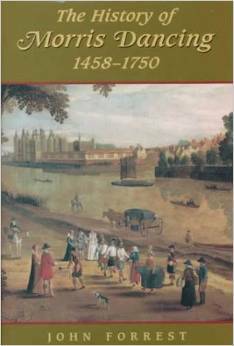 They were banned by the Puritan parliament in 1644 but made a joyous return under Charles II. Images sometimes show people dancing around them, but they are NOT morris dancing. It is also notable that there are no ribbons. Maypole ribbons were an invention of the 19th century Romantic revival, probably by John Ruskin. From that point on for about 100 years, maypole dancing had been relegated to children. Here’s me at my son’s school when he was in kindergarten (he’s in the crossed ribbons) and my late wife (patchwork dress), doing my best to muddy the waters. It was just fun. Some European cultures have special May Day foods (http://www.bookofdaystales.com/walpurgas-nightmay-eve/), but England is not one of them. So I’ll have to fall back on my habit of giving you a “typically English” recipe. May Day is supposedly the start of summer in England – which means it is often grey, cold, and drizzly. It’s a tradition !! There are some great summer recipes though, such as summer pudding and trifle. Eton mess is a great classic for which you need no more than a photo and a hint. Mix into a bowl of whipped cream (with some vanilla extract and sugar) sliced strawberries, and chunks of meringue. I either buy the meringue or make it from all the leftover egg whites I have from recipes using only yolks. 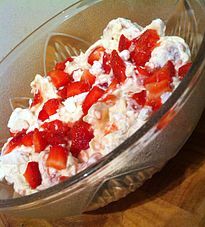 You can make Eton mess with any soft fruit such as raspberries (my fav), blackberries, mangoes, bananas, or a combination. 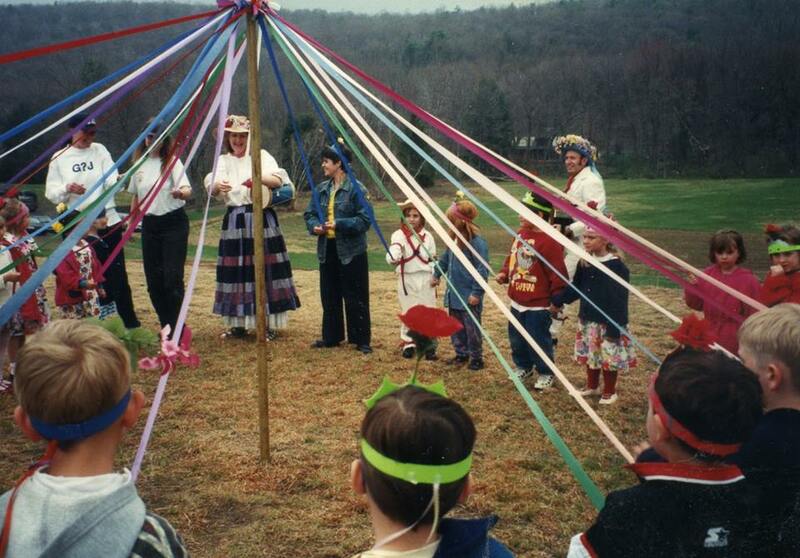 I did maypole dancing at primary school – the fun of weaving the ribbons into different patterns !! !